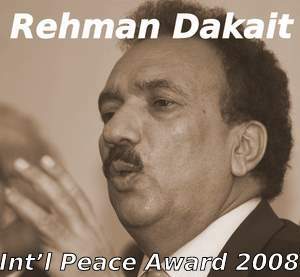 International Human Rights Commision has nominated Advisor to the Prime Minister on Interior Rehman Malik for the ‘International Peace Award 2008 for War against Terrorism. The real problem with Pakistan is there appears to be a complete collapse of moral fabric. I still choose to call him Rehman Dakiat for his endless list of goofups. It should be recalled that this third Peoples Party nomination is right on the footsteps of Sherry Rehman being nominated for International Peace Award 2008 for Democrats a few months back. Its disgusting and I think if this award is being given to Rehman Malik, its credibility is questionable and such an award will offer no face lift. Don’t tell me they really call it “Peace Award for War” … (oxy)morons! what a cad. for a minute i simply blanked out coz i thought u were refering to the dacoit who runs lyari. dacait is a kind word for rehman malik as he is a man of no scruples. even dacoits have a kind bone inside their body. this man should be hanged. GOD! What is this world coming to?! LOL! are they friggin’ serious? Signs of time man signs of time…. This Zardari represents the scum and trash of Pakistan. We, the nation of Pakistan pray that this filth joins his ugly wife soon. He is the reason why Pakistan is a broken, poverty stricken nation. This vermin should not be here. Americans, should now realize why there is so much hatred against their country when they allow and accommodate terrorist filth like Zardari (their new puppet). Can some one please search the history of this dakait. He is a suspicious man ever since BB is out of the scene. Rehman ‘Dakait’ eh? Sir, whatever happened to your importance of judiciary rant? I thought only courts and Imran Khan had the right to convict. So even the international human rights commission is politicized now. Disgusting. The guards at marriot deserve the award if anyone. Sir, yes, any individual or organization that disagrees with you is evil, and deliberately so. Well Gorbachauve had it,I think so………..what are the intentions of Mr.Dacait. Yes he should get this AWARD atleast our QAUM will start to see the value of these “AWARDS”. I nominate Rehman Dakait for the award of “Biggest Bhand”. Rehman Malik was a broker btw BB and Mush deal and later when BB came back He was the chief responsible of her security. What kind of Peace he’s generated nothing but he’s the agent of Mossad and RAW in Pakistan I bet thats why Rehman Dakait being nominated for this award. The awarding body is the International Human Rights Commission. The name suggests that it is a legitimate, international organization perhaps based in New York, Geneva, or London. But no, a simple Google search brings us to the website (cheapo couldn’t even get his own domain name) of the IHRC (providing it with an acronym gives it undeserved legitimacy), which demonstrates it’s a one-man show run by a shady character in Islamabad. The IHRC’s website provides the visitor with a few minutes of entertainment. We learn that the group’s “world chairman” is “Ambassador Dr.” Muhammad Shahid Amin Khan. His bio provides no evidence of diplomatic service that would produce the title of ambassador. One is also suspicious of the veracity of his claim of being a doctor. nota, soooooo, if I understand you right this is an affair between the DAKOOS….Nothing to do with us right! NM rashid was an angry man when he wrote these words, Today this applies to most of our “Jamhoori Leaders” who came to power through “Heavy Mandate” of our illiterate & stupid “Awaam”. N M Rashid was angry, but I am angrier!